A Co Armagh grammar school has rejected a highly critical inspection report which has resulted in the school being placed in formal intervention by the Department of Education, The Detail can reveal. 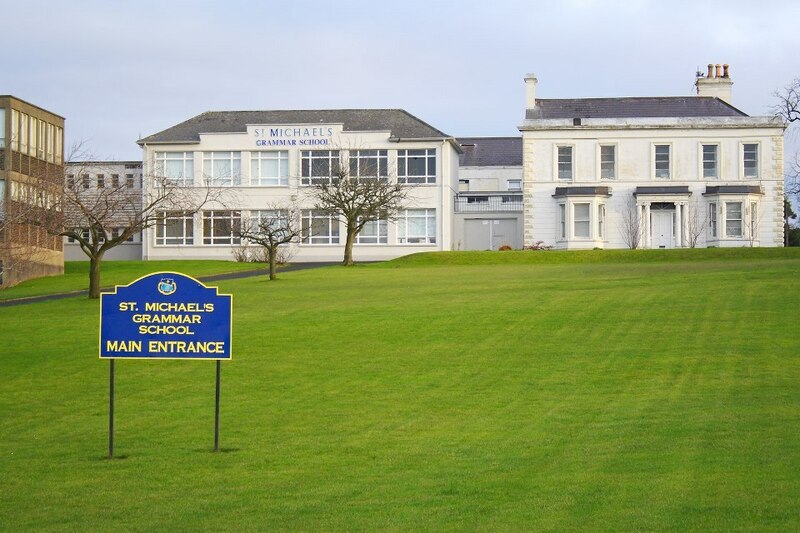 St Michael’s Grammar School in Lurgan is only the second grammar in Northern Ireland to have formal intervention measures imposed on it by the department after the Education and Training Inspectorate (ETI) rated the school as “inadequate”. The school will be monitored closely by the department and must draw up a formal action plan to make improvements. In a hard-hitting statement, St Michael’s principal Gerard Adams has strongly contested the outcome of the inspection which took place in March of this year. He claims in his eight page response that the school has been treated unfairly and he strongly rejects the inspectors’ key conclusions. Mr Adams also claims it is “inherently unfair and unjust” that the school did not have the opportunity to question or challenge the inspectors’ findings or present further evidence before the report was published. Mr Adams’ statement concludes: “I and my staff, teaching and non-teaching, totally reject the conclusions of this report. We accept that there are areas in which we can improve but in respect of almost all of those areas work is already ongoing; little, if any of it, has been acknowledged or recognised in this report. The ETI report on St Michael’s was published yesterday. In January of this year, Education Minister John O’Dowd announced funding for the amalgamation of St Michael’s Grammar with the two maintained non-selective Schools in Lurgan – St Mary’s and St Paul’s. In the Craigavon/Lurgan area an alternative transfer system, known as the ‘Dickson Plan’, currently operates. In this system pupils automatically transfer from primary to junior high school at age 11 years and academic selection is delayed until the age of 14 years when some pupils transfer into grammars. A total of 24 schools are currently on Department of Education’s formal intervention list – including 11 primary schools. The only other grammar school to have been on the list is Cambridge House Grammar in Ballymena, which exited the formal intervention process last month. The Education and Training Inspectorate (ETI) conducts monitoring visits and a follow-up inspection within 12-18 months of the original inspection. Further action if required can include closure of the school, restructuring of the governance, leadership and management, merger with another school or closing the school and re-opening after a period with a new management team. The inspection report says St Michael’s has 570 pupils. The inspection focused on achievements and standards, learning and teaching, curriculum provision and on leadership and management across the school as a whole. Specialist inspectors paid particular attention to English, mathematics and science provision. The inspectors rated the school’s ‘overall performance level’, ‘achievements and standards’ and ‘leadership and management’ “inadequate”. ‘Provision for learning’ was rated “satisfactory”. The inspectors said that the overall standards achieved by the pupils are inadequate. The report does state that the pupils are well motivated to learn and have good personal and social skills. The percentage of Year 12 pupils obtaining Grades C or above in at least seven GCSE subjects is 83.9% which the report states is well below the Northern Ireland average for similar schools in the same free school meals category. The percentage of Year 12 pupils obtaining Grades C or above in at least seven subjects including GCSE English and GCSE Mathematics is 76.5% – which the ETI says is also “well below average”. The inspectors say: “The overall levels of attainment at GCSE level are too low. Twelve GCSE subjects at grades A*-B, including English, mathematics and all of the science subjects, are more than 10% points below the NI average. Turning to Year 14 pupils, the inspectors said 62.3% were obtaining Grades C or above in at least three A-levels and that this is also “well below average”. The report states: “Overall, the percentage of year 14 pupils obtaining grades C or above in at least three GCE A levels is not high enough. “The pupils attain very good standards in English Literature and good standards in mathematics; with a significant uptake in these subjects over the past three years. The pupils also attain well in the applied subjects on offer. The inspectors said that pupils who require additional support make good progress and achieve well in external examinations. And they claimed there is a “lack of clarity in the strategic future of the school”. The quality of pastoral care, careers education and the overall quality of the provision for pupils with special educational needs were rated “good”. The school, in collaboration with other schools in the Craigavon Area Learning Community, provides the pupils with a wide choice of subjects, including opportunities to experience shared learning with pupils from differing backgrounds. The inspectors conclude: “In almost all the areas inspected, the quality of education provided by the school is inadequate. The areas for improvement outweigh the strengths in the provision. “The inspection has identified significant areas for improvement in standards, learning and teaching and leadership and management, which need to be addressed urgently if the school is to meet effectively the needs of all of the pupils. St Michael’s main school website states the site is “temporarily unavailable” and instead provides a link to the principal’s response to the inspection report. He claimed that it was “inherently unfair and unjust” that the school did not have the opportunity to question or challenge the inspectors’ findings or present further evidence. “The first opportunity we are allowed to comment on the findings is after publication, at which point our personal and professional reputations and the reputation of our school have already been irreparably damaged if not thoroughly destroyed. “At no point is there a right to respond, a right to appeal. Such a situation can never be anything other than unjust. He goes on to specifically address and challenge many of the criticisms raised in the inspectors’ report. This includes: “Although the inspection documentation specified that a number of different areas would be looked at, the final evaluation of our schools came down to one single factor: examination results. He also said: “Although we deliver a significant number of vocational courses, and were ahead of most other grammar schools in doing so, these results are not included in our examinations data and we had to argue to have them referred to in the report. Mr Adams continued: “While my staff and I are not at all complacent about current levels of achievement and are committed to continuing along the path of self-improvement, we cannot see how any objective assessment can come to the conclusion that out results are inadequate. “Even by the assessment of ETI, the strengths of St Michael’s outweigh the weaknesses. “The board of governors of St Michael’s will make their formal response to the final report at the appropriate time and I, as principal, will initiate, with my senior leadership team, an appropriate action plan to deal with the criticisms laid before us. “We will do so professionally and to the best of our ability but we will also do so with an unshakeable belief that we have not been treated properly or fairly and we, I and my staff, teaching and non-teaching, totally reject the conclusions of this report. “We accept that there are areas in which we can improve but in respect of almost all of those areas work is already ongoing; little, if any of it, has been acknowledged or recognised in this report. The Detail asked the Department of Education and the Education and Training Inspectorate for a comment on Mr Adams’ statement. An ETI spokesperson said: “The inspection of St Michael’s Grammar School was carried out in line with the Education and Training Inspectorate’s normal inspection protocols. “Inspection remains at the centre of the department’s raising standards and tackling underachievement priorities and inspectors work at all times in an independent and impartial manner. “Until today the ETI had not received any expression of concern from the school about this inspection. Education Minister John O’Dowd attended St Michael’s annual prize-giving evening in December 2011. He said then: "The school consistently records high attainment in public examinations and I welcome the opportunity to celebrate the pupils’ achievements formally. “The high standard of achievement of the school’s pupils is a tribute to the community ethos of St Michael’s. I commend the principal, staff, board of governors and parents for their hard work and dedication."